Keep your shoes and footwear organized with the Furinno shoe rack collection. This collection offers various sizes and structures to suit your needs and space. These shoe racks can hold a minimum of 5 pairs of shoes all the way up to about 13 pairs. Unlike most of the poles and panels system design, this time we added some supporting panels to enhance the stability and durability. The shoe racks consist of PVC tubes and particle boards. All parts are tested for increased strength and firmness. 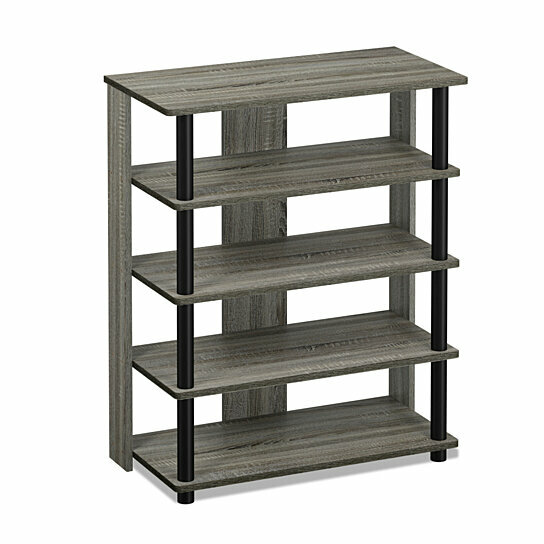 They come with 2 refreshing colors (Espresso and French Oak Grey) that will fit perfectly with any style of home. The assembly process is made easy with the provided parts and hardware. Assembly instructions are revised repeatedly to ensure that it is clear to read, simple to understand and safe to work. Care instruction: wipe clean with clean damped cloth and avoid using harsh chemical to prevent damage to the furniture. All the pictures are for illustration purposes only; decor items are not included in the set. Can hold approximately 8 pairs of shoes. Easy assembly with provided parts, hardware and clear assembly instruction. Laminated to protect the print and make it easy to clean. It would not get bubbled or crinkled; no harmful emission material.